Providing a space for guests to be creative, silly, and enjoy themselves - alone or in groups - is a wonderful addition to a wedding. We’ve recently begun to offer a photo booth add-on to our wedding packages, which has quickly become one of our most popular wedding options! Photobooths have skyrocketed in popularity thanks to their universal appeal; even the wallflowers will love dressing up and striking a pose for the camera! There’s no limit on the number of booth images one could take, providing another source of all-night entertainment for your guests. We’ve all seen traditional photo booths in malls, stores, and parties - small boxes with a curtain and friends piled in one on top of the other. We take a slightly different approach to our photobooth in order to provide our clients with the most fun, highest-quality experience possible. Our booths are “open-air,” meaning there isn’t a small box to cram into! Instead, we provide a larger area with a backdrop and room for family and friends to spread out, expressing themselves with a variety of costumes, props, and poses. Open-air booths also reduce the expense, stress, and logistics of having to haul a tall, heavy object in and out of the venue. 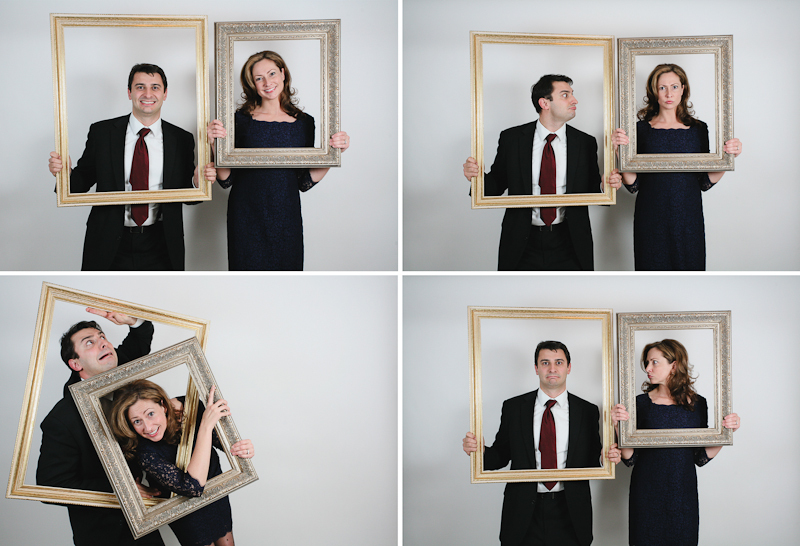 We are incredibly pleased to offer you exceptional image quality for your photobooth. Unlike traditional photobooths you might see at the mall or parties, our booths are set up with a top-of-the-line DSLR camera, allowing for beautiful, high-resolution pictures to be taken on the spot. We set up each photo-booth with professional-grade lighting to ensure your guests are beautifully lit and look their best. We work hard to bring you fabulous image quality throughout your wedding experience, and the photobooth is no exception! Our clients are thrilled with their photobooth images, which can be printed in any form from traditional photo strips to large-format wall prints. 1. Initial Consultation We will work with you one-on-one before the wedding to choose a convenient location for your photobooth that’s easy for guests to find while also not distracting from the main events. Some venues may have rules about where a booth may or may not be set up, so it’s best to plan your booth well in advance to prevent any last-minute surprises! 2. During the Event We will provide a professional to manage the booth at all times during your event so you and your guests can relax and enjoy the dress-up and posing without worrying about taking the photo or any logistics. Having a camera operator at your booth will also ensure your images are safely backed-up and all equipment is working properly during the event. 3. Viewing & Prints Brett Alison Photography does not provide any on-site printing services due to the logistical difficulty and extreme sacrifice in print quality. Instead, we display your digital photobooth images in an online gallery just days following the event, with a link to send to guests for their viewing pleasure! Beautiful, professional quality prints will be available for purchase through the online gallery, or guests can download their photographs at high-resolution (FOR FREE) and print their own images! You will receive all photobooth images on DVD with the rest of your wedding images.